Thinking of buying in Downtown LA? Here's what you need to know. Posted by Brian Enright on Thursday, March 28th, 2019 at 10:26am. Although the revitalization of downtown Los Angeles hasn’t been overnight, its momentum has picked up dramatically in recent years. In the past five years, the area has seen the emergence of more than 500 new restaurants, bars, nightclubs and retail shops. Overall, Luxury condo/loft prices in DTLA are holding steady at an average Sold Price of $680/Square Foot with a .7% annual price change. 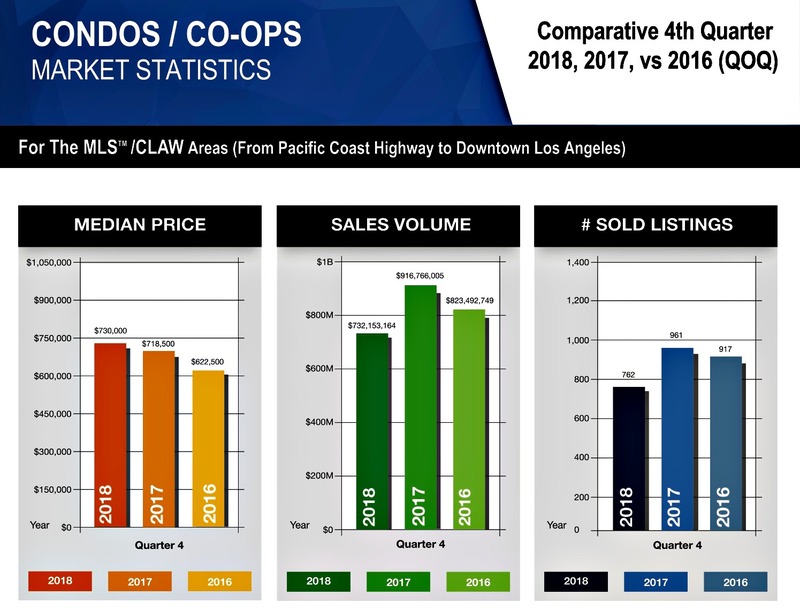 Although the sold volume for DTLA dropped to 459 units in 2018 from 482 units in 2017, it represents over 50% of the sold volume in all Los Angeles areas covered by the MLS (See the chart below on Condos Market Statistics). This is indicative of the continued high demand for Downtown LA real estate. The median Price Per Square Foot for DTLA Condos/Lofts has an annual increase of 0.7% in Q1 of 2019 compared to almost 10% annual increase in Q1 of 2018. We believe this is due to the recent interest rates hikes and the decrease in buyer demand resulting in a short-term buyer market in Downtown LA. 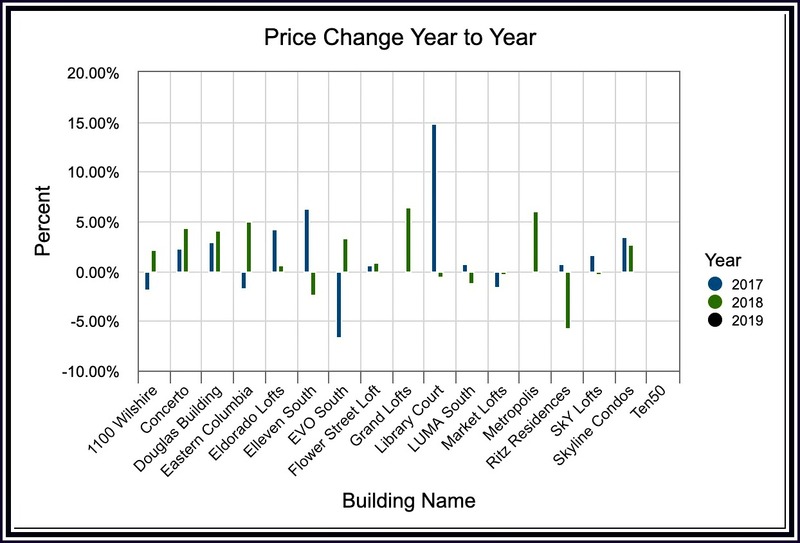 This chart displays the Price per Square Foot for Q1 of 2019 for many of the buildings we service in Downtown LA. Contact me for Market data of a building not shown on this chart. Base on this chart, Metropolis is the most expensive luxury residence in DTLA with an average price of $1,153,000 for a 1,000 SF condo. And Flower Street Loft is the most affordable luxury condo in DTLA with an average of $523,000 for a 1,000 SF Loft. Typically there is more upside potential to invest in a building at the lower price range. With the higher interest rates, we will continue to see price leveling off and price trending down in some higher priced buildings like the Ritz- over 5% drop in 2018. 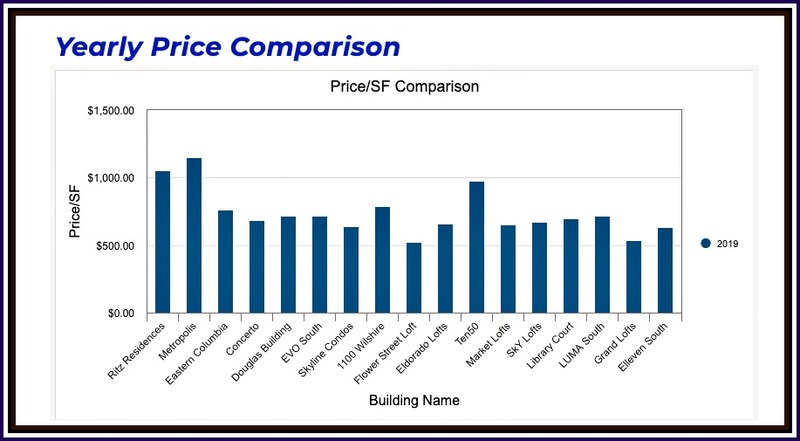 Price will continue to stay flat for most building with minimal gain or minimal loss depending on the demand of the building. We are expecting prices to slowly rise coming into the summer season when buyers are adjusted to the new interest rates provided economy remains strong.